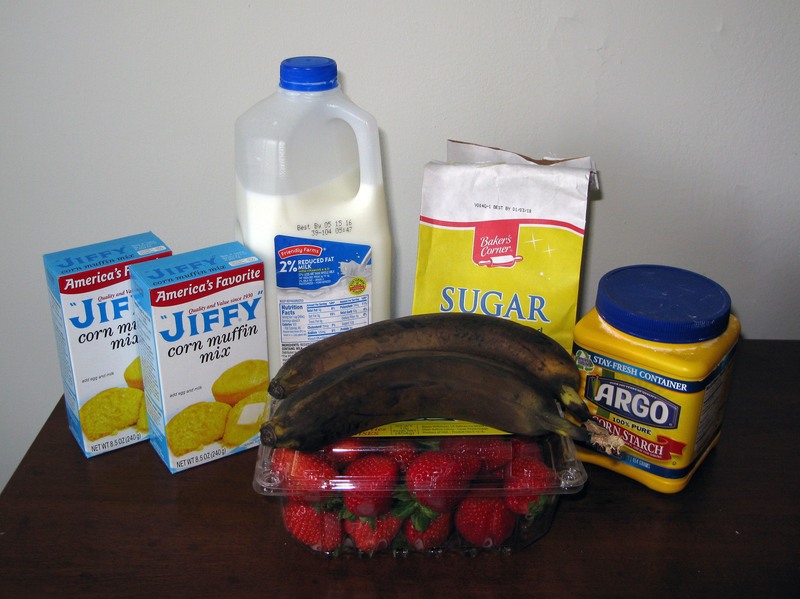 Easy Strawberry Banana Cornbread | I Wanna Bake! 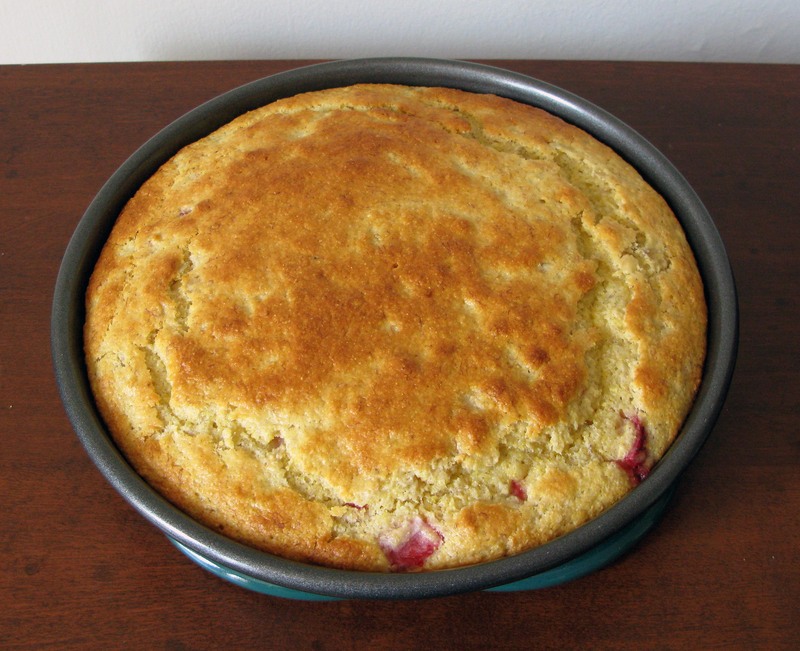 This cornbread is great for breakfast or dessert (or any meal you want, really). It is delicious on its own, but the strawberry sauce adds a nice touch of sweetness. If you don’t want to spend the extra (though minimal) effort making the strawberry sauce, you can heat up some strawberry jam instead and call it good (I won’t tell). Really any fruit jam will do, as will good ol’ butter. I did screw two things up while making this: first, I messed up the strawberry sauce because I was too inattentive while it was thickening (it turned into a weird, super thick, Pepto Bismol-colored muck that had a bit of a jello-like consistency). Fortunately, I had some frozen strawberries lurking in the back of the freezer, so I was able to do it over with better results. This is how I know that this will work equally well with fresh or frozen strawberries (I’ve made this before with fresh strawberries successfully, so don’t take my recent failure as evidence that it won’t work). The second screw-up was under-baking the cornbread. The top looked perfectly browned, and the toothpick I stuck all the way into the center came out clean as a whistle, so I called it done. However, the center sank once I turned it out onto a plate, and when I cut into it, uncooked batter oozed out of the center. To save it, I baked individual pieces for an additional 5 minutes, and it worked out ok. I’ve compensated for this by increasing the baking time below. I’d also suggest pressing the top of the cornbread as one of your doneness tests. It will sound squelchy if it’s not done yet, but if it is done, it should be springy and firm. As a final note, I chose to use boxed cornbread mix because (a) it’s easy, and (b) I haven’t found a scratch recipe yet that I felt was sufficiently better to justify the added effort and ingredients. If anyone out there has a really great cornbread recipe that will prove me wrong, you know where to send it. I’m always open to trying awesome new recipes! I played cd roulette this time and picked something at random out of my cd tower (yes, as I’ve pointed out before, I still have cds and a tower to store them in). I landed on Cheap Trick at Budokan, and it worked out quite well. After all, what says Sunday morning better than classic rock and screaming, Japanese teenagers? Ok, maybe The Commodores do. Still, I think I’ll stick with Cheap Trick. Preheat your oven to 400°F. Line the bottom of a 9″ cake pan with a circle of parchment paper, or grease the pan. In a large bowl, mash the bananas with a fork. Mine ended up a little chunky, so if you want yours smooth, you can put them in a blender instead. 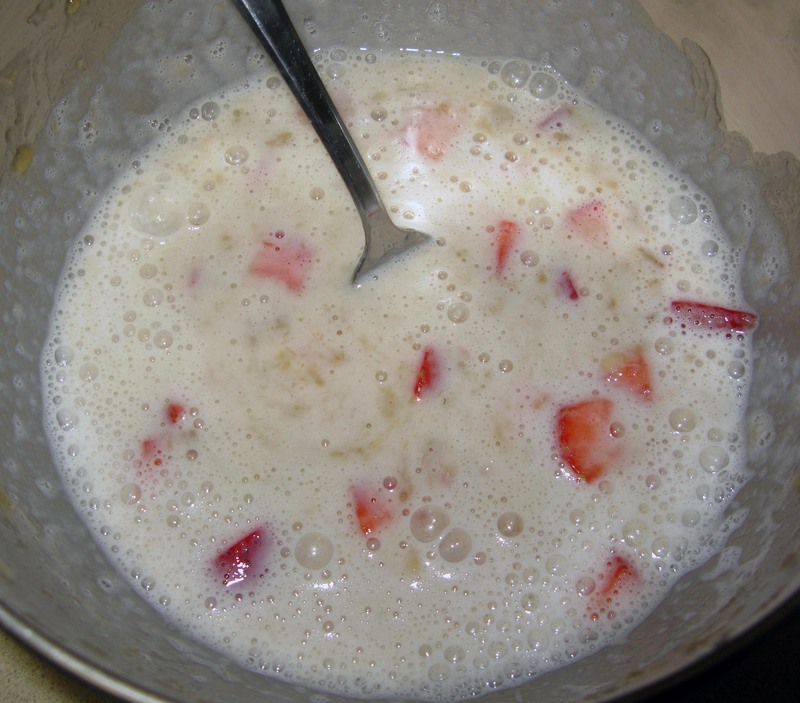 Stir in the 4 ounces of chopped strawberries, then stir in the milk. Stir in the cornbread mix until it is fully moistened. The batter will be lumpy. Let the cornbread cool in the pan for 5 minutes, then run a sharp knife around the edge of the pan. Place a plate on top of the cake pan. Very carefully (and quickly), flip the pan over so that the cornbread is upside down on the plate. Remove the parchment paper from the bottom and place your serving plate on top. Flip the cornbread again and remove the extra plate. Leave it to cool. 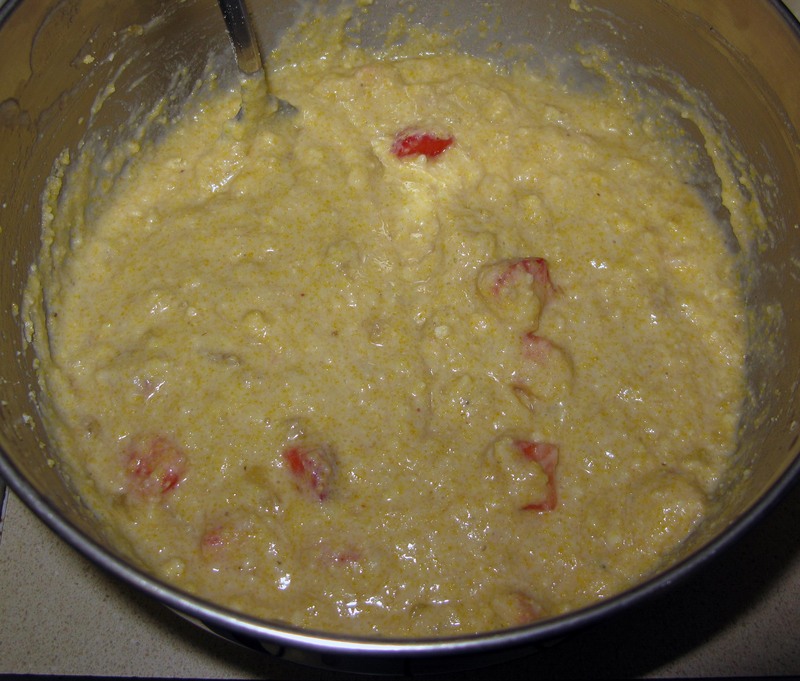 While the cornbread is cooling, prepare the strawberry sauce (if desired). In a small bowl, stir together the sugar and cornstarch. Heat the remaining strawberries in a medium saucepan over low heat until they begin to break down and release enough juice to almost cover themselves. Stir in the sugar mixture and increase the heat to medium. Cook the sauce until thickened, stirring frequently. 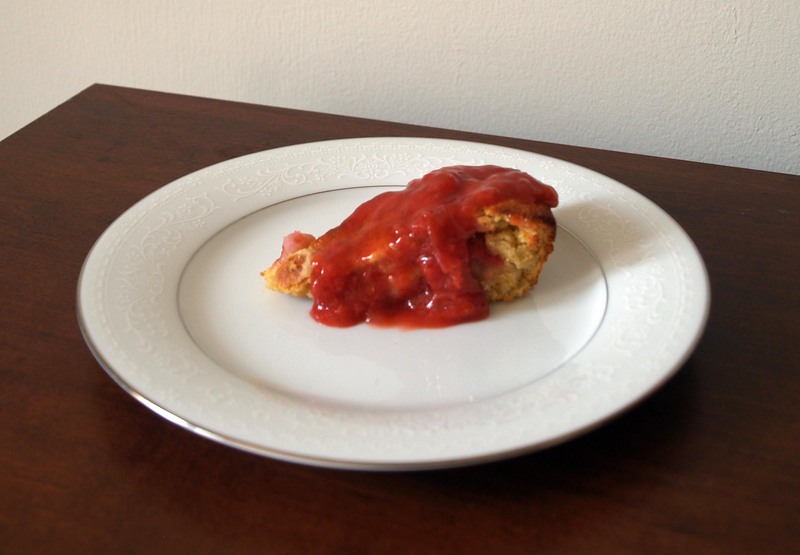 Slice the cornbread into wedges and serve topped with the strawberry sauce.